There are nine undergraduate campuses in the University of California system: Berkeley, Davis, Irvine, Los Angeles, Merced, Riverside, San Diego, Santa Cruz, Santa Barbara. 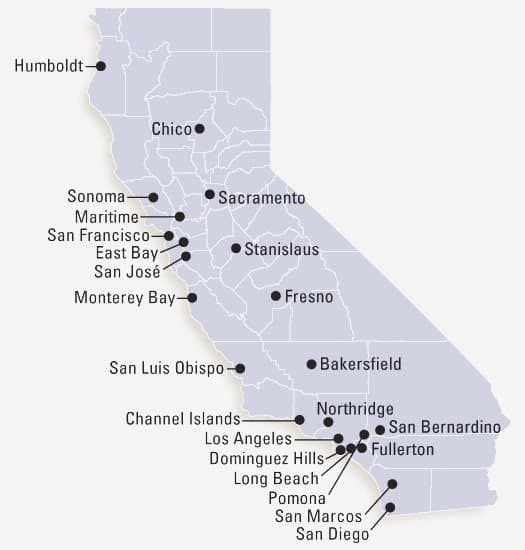 There are 23 campuses in the California State University system (map to the right). California public schools graduate about half a million high school seniors every year – that’s just from PUBLIC high schools. The CSU system as a whole, all 23 campuses, has 484,000 undergraduate students; the UC system has about 223,000 undergraduate students. If you add these numbers, and divide by four (to get what COULD be the capacity for a freshman class), you will find that California public universities have the capacity to enroll fewer than 200,000 first-year students each year. The good news is that California high school seniors have many, many public university options. The bad news is that there are clearly more desirable and less desirable locations, and this is reflected in the number of applications each receives. Every year we have students (and parents) surprised when they are not admitted to a particular UC or CSU campus. The reality is that times have changed since most parents applied to college. This progression shows California’s growth. My dad, who entered UCLA in 1961, gleefully reminds me that he “just signed up” for UCLA – and he was an engineer. When I applied to college in 1988, San Diego State was a “party school.” It wasn’t hard to get in with a 3.0! Just last week, San Diego State reported that their application pool was up again this year – more than 69,000 students applied for freshman admission to a campus that enrolls a total of 34,000 – which means the max they will want in their freshman class is about 8,500. Of course, San Diego State admits more students than they have room to enroll – this is because they know their admitted students will have other choices, and some will enroll elsewhere. They factor this into their admission process – it’s called yield. This week we learned that UC San Diego surpassed 99,000 applications for freshman admission this year. UCSD enrolls a total of 30,000 students, and they admit some as junior transfers, so while you might think that they would admit a freshman class of 7,500, it’s likely that their class is a bit smaller than that to leave room for transfers to join the class later. So basically, a hundred thousand applicants vying for fewer than 7,000 spaces. We’re getting our numbers from the UC InfoCenter, and the CalState system directly, by the way. Layer on top of this another problem: public high school counselors in California are responsible for an average of over 700 students. Even in private schools, counselors sometimes have a caseload of 40-50 students. Many California families aren’t aware of the growing competition for our public university systems, and don’t have the one-on-one time with their counselor to learn about today’s reality. This is where Magellan comes in. It’s not that school counselors don’t have the right information, it’s that they don’t have enough time with each student to help them see not only their in-state options, and determine how competitive they are for UCs and Cal States, but to see the vast supply of other options. Here’s the actual good news: there are 2,200 four year colleges in the United States! Even if you limit yourself to a small geographic area, or want to stay closer to home, or want/need to keep costs down – there are great choices out there. Some large, some small, some in cities, many not. Many with school spirit, and a Greek system, and many without. What’s your FIT? Here’s the actual good news: there are 2,200 four year colleges in the United States! And this is where Magellan comes in. Our counselors are all trained to help students see beyond the names you know, and think more deeply about the right college fit for YOU. Our job is to make the process more organized and less stressful, for both students and parents, and to ensure that students have real choices at the end of their senior year. Our job is to help you child find the place where s/he is happy and successful. If you think you want some one-on-one help with THAT, please feel free to get in touch. We have just a few spots left for our Class of 2020, and we are just starting to work with families in the Class of 2021.